Get TEFL Certified at Our Centers or Online! 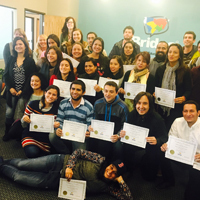 BridgeTEFL offers a portfolio of programs for global English language teachers. Earn an internationally accepted TEFL certificate from anywhere in the world! Get certified in just 4 weeks! Take the esteemed Bridge IDELT (a joint certificate with Metro State University of Denver) or the Cambridge CELTA at our training center in downtown Denver. Combine Teacher training and English classes! Bridge welcomes cohorts of global English language teachers in our custom study abroad programs in Denver.